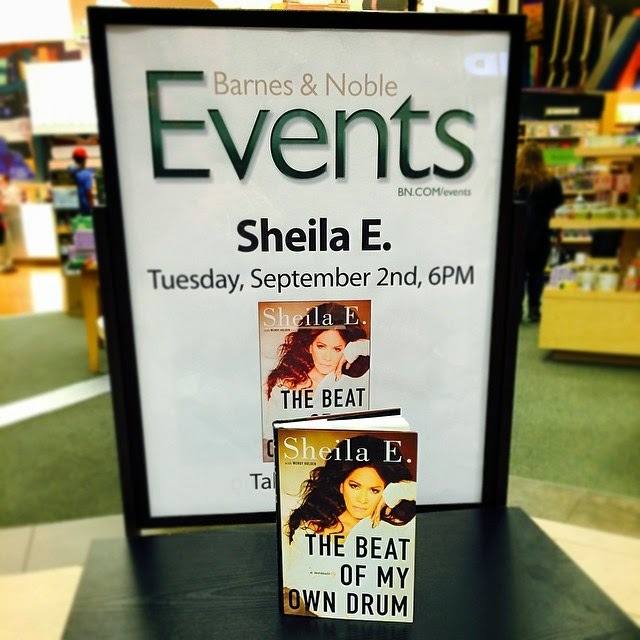 Percussionist extraordinaire Sheila E. will be signing her book, "The Beat Of My Own Drum," this next Tuesday, September 2nd, 6pm @ Barnes & Noble - NY. Jazz Connect Conference Returns to NY in January! The Jazz Connect Conference, organized by JazzTimes and the Jazz Forward Coalition, announced the dates and location for the annual gathering of the jazz community in 2015. 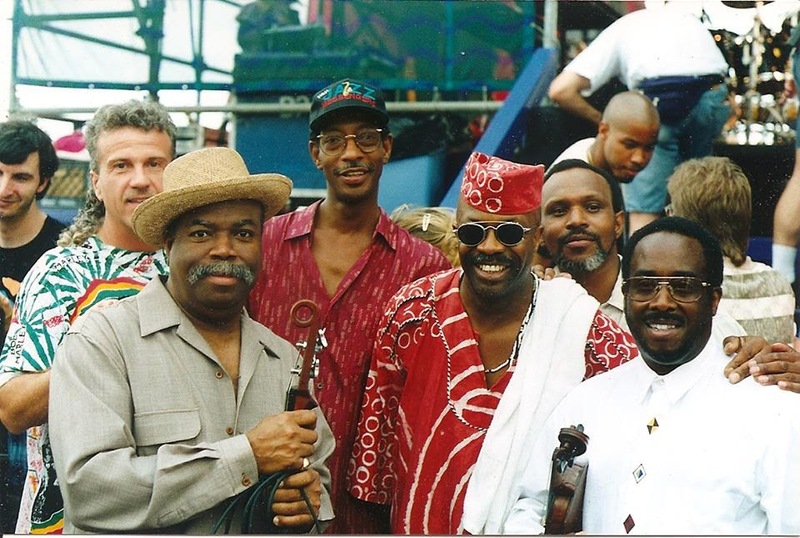 The conference will be held January 8-9, 2015 at Saint Peter's Church in New York City and will lead into the annual APAP (Association of Performing Arts Presenters) Conference as well as Winter Jazzfest. Now in its third year, the conference will continue to focus on vital issues affecting the jazz community carrying on the format and momentum from the January 2014 event which had over 800 registrants. Moderators and panelists will again include an impressive cross-section of artists and professionals from around the world. Early Bird Registration is only $75 until September 30, with additional discounts offered to members of various organizations. The Jazz Connect Conference is organized by Peter Gordon of the Jazz Forward Coalition and Lee Mergner of JazzTimes, with assistance and input from over a dozen industry professionals. With a theme of "Strength Through Community" the conference will again bring together a wide cross-section of the jazz community for 12 workshops and 5 plenary sessions, on a variety of timely subjects to engage, stimulate and challenge the registrants. JazzTimes is the official publication for the event. The Jazz Connect Conference was one of the pre-conferences tied to APAP, but due to the large number of attendees, the conference moved from its location for the last three years at the Hilton New York to nearby Saint Peter’s Church. 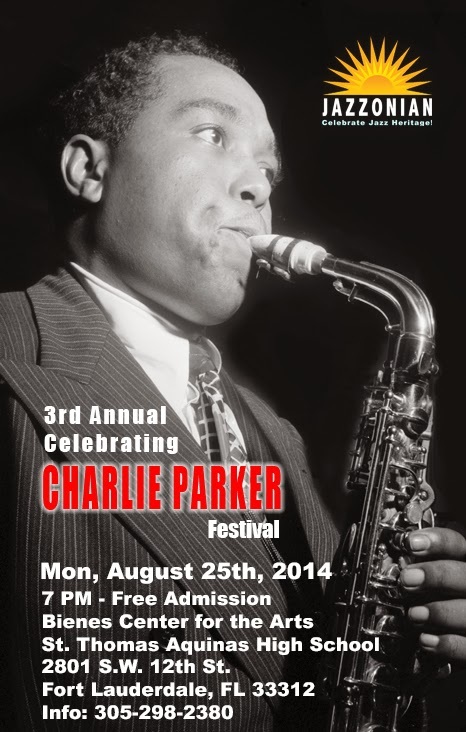 Located at 54th & Lexington, Saint Peter's provides a unique setting for this gathering of the jazz community. The church has a long history of supporting and affiliating with jazz, going back to 1965 when the Reverend John Gensel created the Jazz Ministry. The church will be providing the conference with multiple and spacious multi-purpose rooms, including a black box theater, for the workshop and panel sessions. Panel and workshop topics will be announced soon, but the Conference has left a time slot open for a "Community Choice" panel. If you have a topic that you think would be interesting to the jazz community, email it to jazzconnectnyc@gmail.com and put “Community Choice" in the subject line. For more information about the Jazz Connect conference, you can e-mail jazzconnectnyc@gmail.com or go to the conference website. 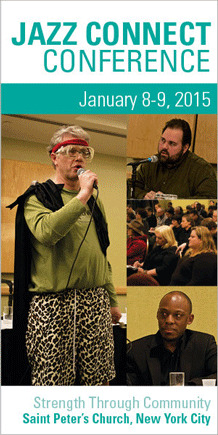 To pre-register for the conference, go to the event page. 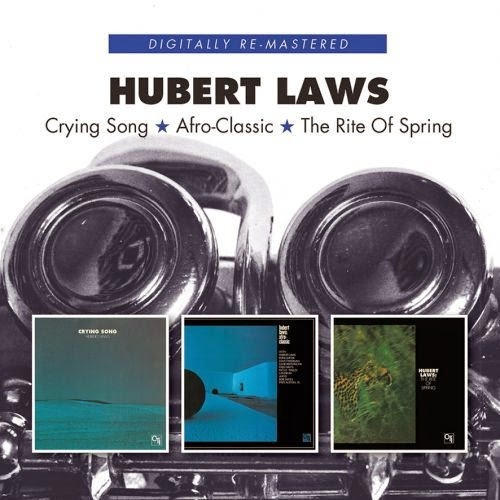 Box Set of the Month - "Hubert Laws: Crying Song / Afro-Classic / The Rite of Spring"
Hubert Laws on CTI Records – a mighty great thing, as you'll hear on these three vintage albums for the label! Laws' first three albums under the visionary production of Creed Taylor, and already featuring that all-star format of sidemen that became one essential point for the CTI success. "Crying Song," though, is a controversial pop-jazz record, recorded mostly in Memphis with members of Elvis Presley's backing band. Actually, it was supposed to be a Stanley Turrentine session. But he couldn't make it at the last moment, due to contractual problems with his previous label, and Creed invited Laws, who was free from his contract with Atlantic. Anyway, the record sounded very different than Laws' 60s Latin sides for Atlantic, and handled in a pop mode that has his flute drifting over a mixture of organ, piano, electric guitars and rhythms augmented with strings – sometimes easy and jazzy in the same moment. Sometimes only easy listening, like happens on "La Jean," "Love Is Blue/Sing A Rainbow" and The Beatles' "Let It Be." Other titles include "Listen To The Band", "Cymbaline", "Feelin' Alright" (written by Dave Mason of the English rock band Traffic from their 1968 album, "Traffic" and also covered by Joe Cocker), and The Bee Gees' "I've Gotta Get A Message To You." Three tracks were recorded in NY with different personnel: the title tune "Crying Song" (a psychedelic remake of Roger Water's ballad composed for the third album by the British progressive rock supergroup Pink Floyd), "Cymbaline" (another track from that same Pink Floyd album, "Soundtrack from the Film More," released in 1969), and Laws' own "How Long Will It Be," the only jazz tune on the album, featuring Ron Carter, Grady Tate and George Benson. "Rite Of Spring," is another story. For many of his fans, Law's masterpiece. It's a groundbreaking record, a mixture of classical themes and jazz, handled with an airy CTI approach – and set to arrangements by Don Sebesky that are simply mindblowing! The album's a wonderful example of the way that CTI really pushed the boundaries of instrumental expression in the 70s – taking Laws wonderfully breathy work on flute, and mixing it with some well-crafted backings that also feature Bob James (Fender Rhodes), Ron Carter (acoustic bass), Jack DeJohnette (drums) and Airto Moreira (percussion) and the secret weapon of the session, Gene Bertoncini on the acoustic guitar. This larger group is handled by Sebesky, who really brings some magic to the record – a sense of sound, space, and timing that's still a heck of a lot more mature and sophisticated than most instrumental recordings coming out today! 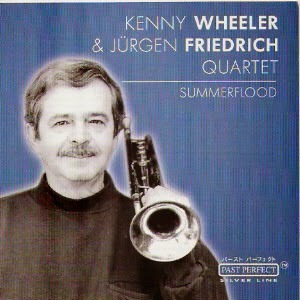 Titles include Faure's "Pavane," an a cappella rendition of Debussy's "Syrinx" that sounds sublime, a bop-classical adaptation of Stravinsky's "The Rite Of Spring" built upon Jack DeJohnette's thunderous drums, and the album tour-de-force, the jazzy baroque version of Bach's "Brandenburg Concerto No 3." Jazz flute and CTI were never the same after this album! "Afro-Classic" is another amazing album, following the same concept of "The Rite of Spring," with the same arranger (Sebesky), most of the same musicians (except for Freddie Waits, then a member of Hubert Laws' touring band, replacing DeJohnnette on drums) – and the cornerstone of the CTI sound! The record's an incredibly baroque set of tracks featuring arrangements by Don Sebesky that mix complicated lines on flute with electric piano from Bob James, into a swirling mass of sound that's warm, soulful, and fuzzy. The record's incredibly hip, even on material like Francis Lai's mellow pop ballad "Theme From Love Story", then a monster hit on the Billboard charts. On James Taylor's "Fire & Rain," that features an hipnotic bass groove, and Bach's "Passacaglia In C Minor", Laws and the group soar away into another plane of being! 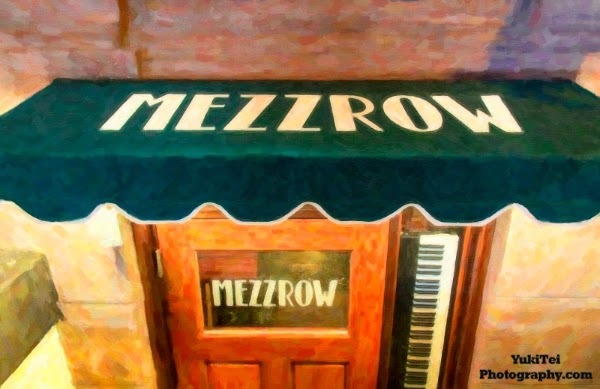 Mezzrow, the new jazz piano room in Greenwich Village, opens on September 3rd with Johnny O'Neal. 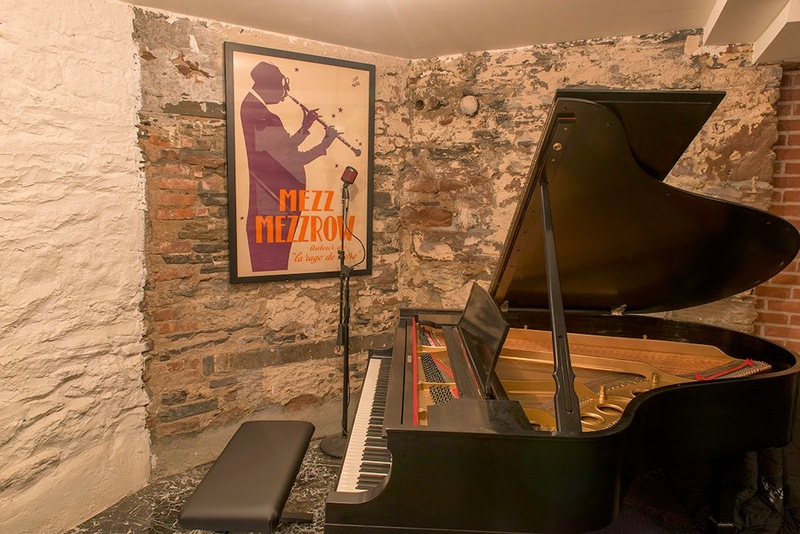 Mezzrow is a listening room and lounge located at 163 West 10th Street (at the corner of 7th Ave.) in the basement space. 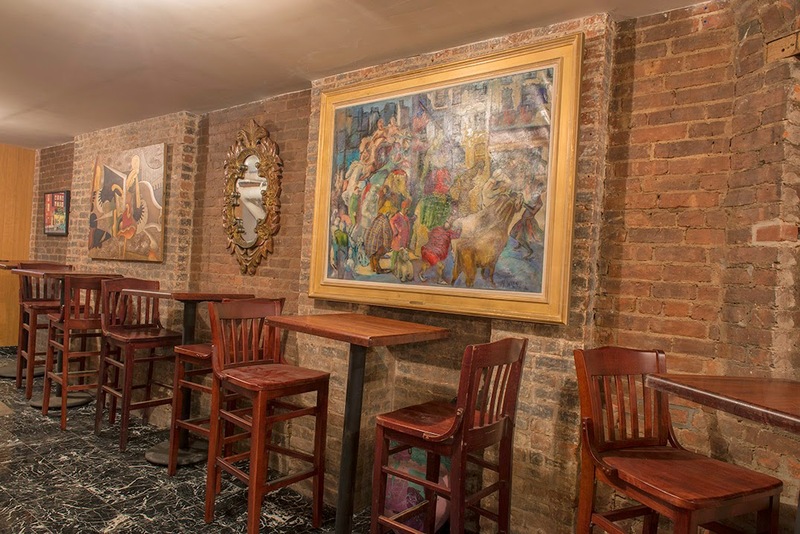 It's an elegant place with an amazing piano and their goal is to feature the best of New York's piano talent in that space. They've already an amazing lineup of great pianists scheduled to come in including Cyrus Chestnut & Dezron Douglas, Rossano Sportiello & Harry Allen, David Hazeltine, Richard Wyands, Aaron Parks, Spike Wilner & Peter Bernstein, Bruce Barth & Peter Washington in September alone. In the next few months they'll got the likes of Ron Carter and Ethan Iverson, Larry Willis with Buster Williams, David Kikoski, Gerald Clayton, Orrin Evans and many, many more. You can see the schedule, and even purchase advanced, guaranteed seats for upcoming shows to insure seats for you and your guests. 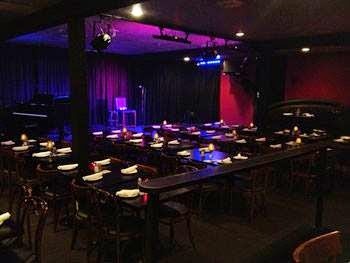 Mezzrow is just across the street from Smalls Jazz Club - guests will be able to go back and forth and enjoy both clubs. 163 WEST 10TH STREET (CORNER OF 7th AVE & 10th ST) - BASEMENT! 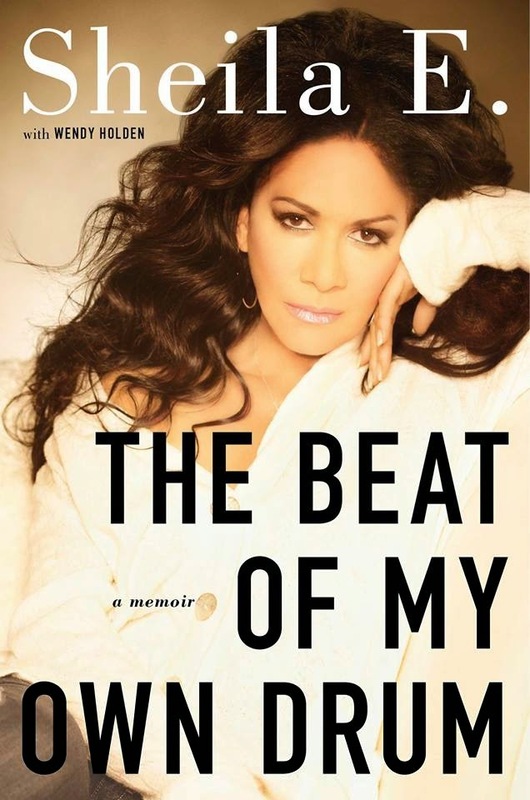 Tune in to watch OK TV USA's interview with Sheila E. tomorrow! 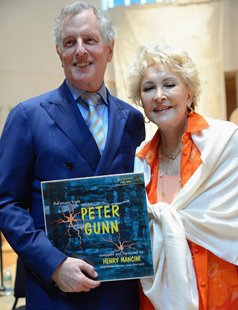 In 1958, the legendary composer/arranger Henry Mancini electrified the world of television music with his dynamic soundtrack for the detective series "Peter Gunn." Not only did he introduce a compelling jazz element into the genre, but he also created a context for the symbiotic relationship between narrative action and its aural environment. The Emmy-winning score - and its double Grammy-awarded album - was performed by an all-star ensemble of some of the West Coast jazz scene’s finest musicians. 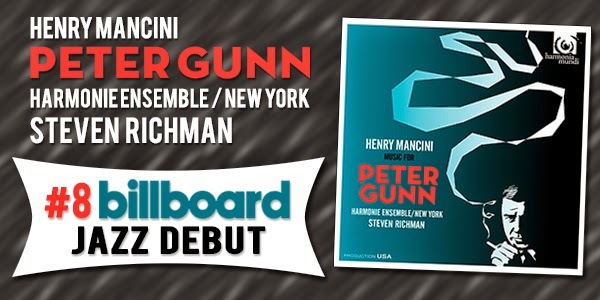 Now, for the first time in more than half a century, the Harmonie Ensemble/New York under the direction of Grammy-nominated conductor Steven Richman takes a new look at this iconic music in the new harmonia mundi release "Music for Peter Gunn." One of the most profound elements of the jazz tradition is that the musicians’ pursuit of personal and singular sounds allows each fresh interpretation of classic works to have a new life of its own. The great orchestral composers like Ellington, Strayhorn, Charles Mingus and George Russell were able to perform the same arrangements of their musical creations over and over, creating entirely new versions freshly sculpted by the personae of the musicians who played it. This recording provides that same substance to these timeless original Henry Mancini compositions and arrangements, proving this music to be as vital and vibrant as it was more than 50 years ago. This is the twelfth album by Mr. Richman and the Harmonie Ensemble/New York, and his third for harmonia mundi, following up on 2010’s "Gershwin by Grofé" and last year’s "Nutcracker Suites Tchaikovsky / Duke Ellington & Billy Strayhorn." As with those two outstanding and highly acclaimed albums, Mr. Richman has assembled the ideal cast of musicians to interpret this music, blending their superb command of ensemble playing with brilliant soloing skills. His deep appreciation of the music and commitment to the highest artistic ideals created the fertile environment that makes this recording so successful. A French horn player before he devoted himself fully to conducting, Mr. Richman had the opportunity to play with Henry Mancini many times. For him, this was truly a labor of love. A key figure is pianist Lincoln Mayorga, who was featured on the Gershwin by Grofé album and had played for Mancini on some of the great composer’s road trips. The remarkable tenor saxophonist and flautist Lew Tabackin – whose presence was so vital to the Nutcracker recording – anchors the highly impressive reed section along with my dear friend Ronnie Cuber, Mark Gross, Lawrence Feldman and Lino Gomez. 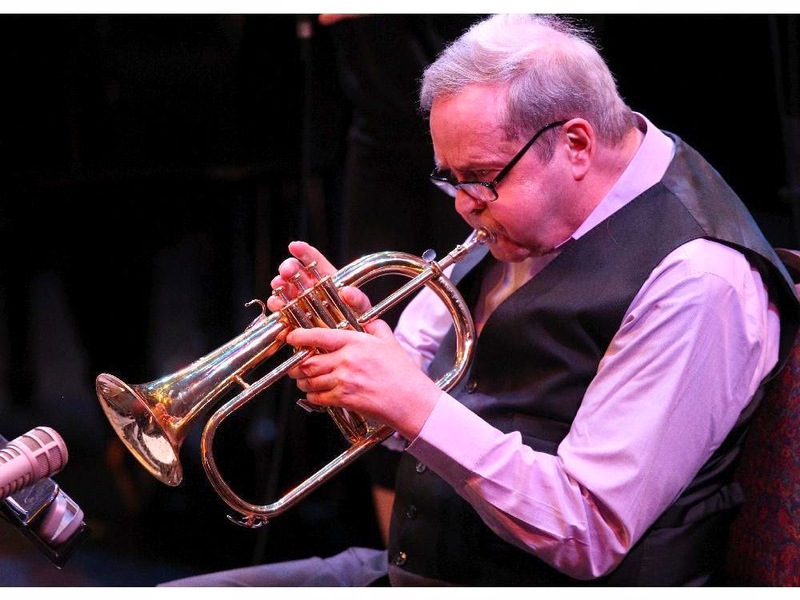 The eminent Lew Soloff heads a trumpet section of Stanton Davis, Dominic Derasse and Joe Giorgianni; with a trombone foursome of Larry Farrell, John Fedchock, Mark Patterson and Frank Cohen. The French horns, so essential to the sumptuous and mellifluous textures that are so intrinsic to Mancini’s sound are played by RJ Kelley, Alexandra Cook, Eric Davis and David Peel. Much of the action in Peter Gunn took place in Mother’s, the waterfront roadhouse that was both Gunn’s hangout and meeting place. The five-piece group that played there set the tone for a good deal of the show’s music and therefore those musicians are of paramount importance to this music. Joining Mayorga in the stellar rhythm section are Bob Mann on guitar (whom I admire since Astrud Gilberto's famous "Gilberto with Turrentine" album for CTI), Christos Rafalides on vibes, and the bass/drums tandem of Francois Moutin and Victor Lewis. Under Mr. Richman’s brilliant direction, this exceptional group of musicians brings the perfect combination of flawlessly tight ensemble playing with the easygoing looseness and vivid spontaneity that makes each solo shine brightly – and always in the proper context, with no grandstanding or virtuosity for its own sake. Although the music remains totally faithful to the original arrangements, the vibrancy and immediacy of today is fully evident. Bob Mann’s guitar solos have a slightly rock-ish element and the horn solos have a somewhat edgier quality. The delivery of the written lines add a bit more soulfulness to the soulful; bluesiness to the blue; and even a touch more savagery to the drive. The two versions of the immortal theme (my favorite versions, besides Mancini's original take, have been the ones by Quincy Jones and Eumir Deodato) that bookend the 16 tracks are absolutely explosive – with the reprise opening up the thematic structure and providing an opportunity for the soloists to really strut their stuff. This recording features all but one track from the first Mancini Peter Gunn album, along with four tracks from the second. One of these is "My Manne Shelly," a dedication to the longtime Mancini collaborator and icon of West Coast jazz, Shelly Manne (this tune was included on the debut album of Eumir Deodato's legendary '60s band Os Catedráticos, "Impulso!" 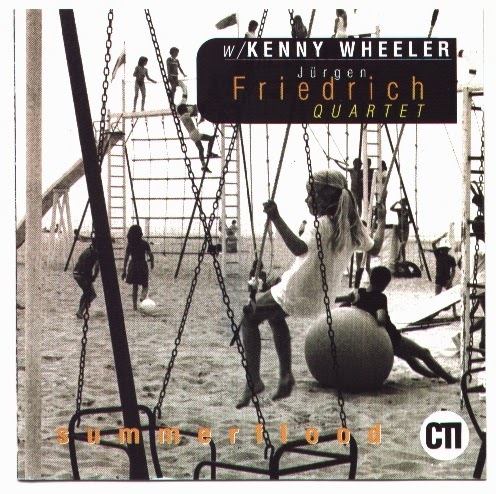 recently reissued on CD under the production of Jazz Station Blog's boss Arnaldo DeSouteiro. Here Victor Lewis pays his own homage to Shelly in the delightful call and response motif of the piece, also highlighted by a burly baritone solo by Cuber. That small group roadhouse feel is offered in sublime fashion with "The Floater," "A Profound Gass" and "Brief and Breezy" – all evoking the fluid George Shearing sound and featuring jaunty guitar and vibes solos. 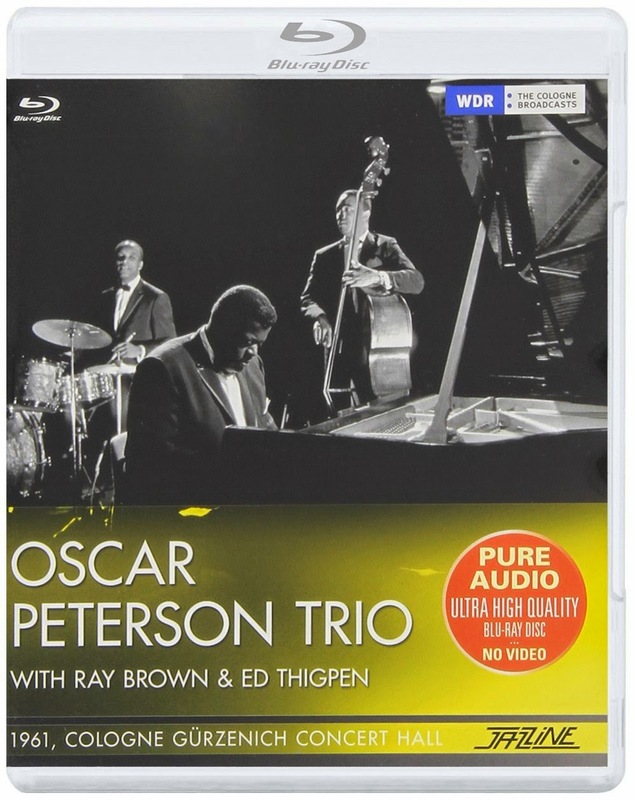 An easy-swinging, hip groove – as suave and sophisticated as the title character – is front and center with "Sorta Blue" and "The Brothers Go to Mother’s." Three ballads offer a romantic setting with the appropriately named "Dreamsville" (Quincy Jones did my favorite version ever!) fueled by guitar and alto; "Soft Sounds," built on a slow walking bass; and "Blues for Mother’s," marked by a deeply soulful alto sax. A raunchier blues groove of the growling sort is the vibe for the slow-boogie of "Spook" and the drawling brass-fueled "Slow and Easy," featuring a gutty trombone solo out of the Lawrence Brown school; while "Session at Pete’s Pad" pushes the pedal a bit harder into a smooth stomp. Designed for the hard-boiled action and chase scenes, there are two virile and impassioned pieces. "Blue Steel" is a dramatic item filled with hollerin’ brass, call and response incantations and a vehement Tabackin solo. "Fallout," opening with briskly walking bass leading into searing flutes, slow boils into a frenzy of growling trombones, wailing French horns and screaming trumpets. While this is landmark music that broke ground for many fine scores to follow, one thing stands high above it all. This is spectacular music played by an extraordinary group of musicians – timeless, powerful and moving. "Brazilicious" @ Kitchen 305, August 29th! This next Friday, August 29: "Brazilicious" @ Kitchen 305! The best party spot north of South Beach, with an array of awesome late night events! Eat what you love...Party how you want! 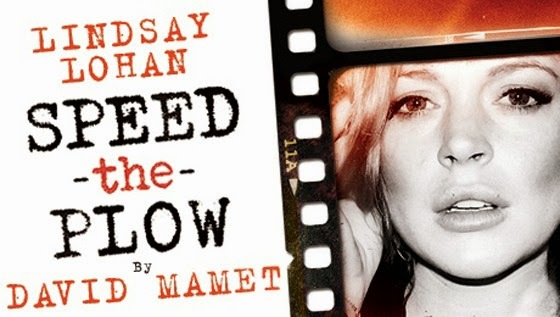 Lindsay Lohan rehearsing for "Speed-The-Plow"
A campaign has been launched to help jazz icon Kenny Wheeler, 84, who together with his wife is experiencing serious financial difficulties related to their health care. Learn how to donate through the link below. It's urgent! 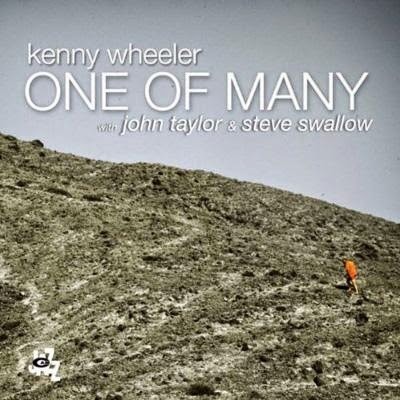 One of the best flugelhorn players in the jazz history, alongside Art Farmer, Clark Terry and Chuck Mangione (yes, bastards purists, Mr. Mangione deserves to be on this list), Wheeler has been a perennial winner in the Jazz Station Polls. 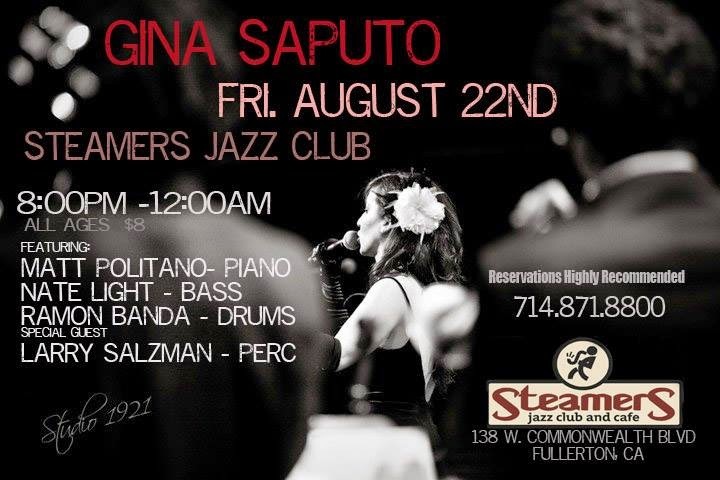 Gina Saputo is back @ Steamers. This next, Saturday, August 23, don't miss our Jazz Princess, Anna Mjöll, live @ Herb Alpert's Vibrato! Labor Day Weekend @ HAZE! 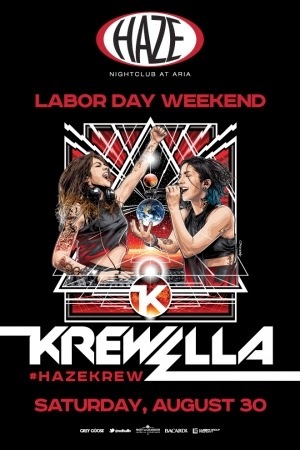 HAZE Nightclub keeps the party going through Labor Day Weekend with a special live performance from KREWELLA. 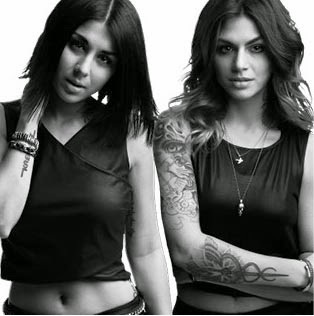 Fresh off their European tour, the Chicago-based trio will treat the crowd to a full set including chart topping hits, “Alive” and “Live For The Night” With KREWELLA in the house, this is going to be one of the biggest parties of the year! Yankee's Legend Bernie Wiliams In Concert! Additional Premium Meet & Greet tickets just became available! Meet Bernie Williams after the show by purchasing Premium price tier tickets in the first 4 rows for $100. Throughout Williams' years with The Yankees, his passion for music never waned, and the sound of a guitar would often be heard emanating from the clubhouse or during team flights. Whether acoustic or electric, a guitar was a constant presence in the star's locker or equipment bag, and it was no surprise in 2003 when he demonstrated how serious his musical pursuit was with the release of his first album, "The Journey Within." The record featured fusions of jazz, rock and the tropical rhythms of Williams' heritage and was met with both strong critical praise and instant chart success- reaching #3 on Billboard's "Contemporary Jazz Chart." Bernie Williams raised his musical game even further with the release of his second album "Moving Forward." Featuring guest appearances by Bruce Springsteen, Jon Secada, Dave Koz, and an all-star cast of renowned studio musicians, "Moving Forward" debuted as Billboard's #2 Contemporary Jazz album in the country, and spawned two consecutive Billboard #1 singles, "Go For It," and "Ritmo de Otono." The album was nominated for a Latin Grammy Award for Best Instrumental Album in 2009. CLASSIC BIG BAND ERA SWING SONGS and/or INSTRUMENTAL TRACKS are needed by a MUSIC SUPERVISOR at a MAJOR FILM STUDIO for use in a TOP HOLLYWOOD FEATURE FILM. He's looking for Songs and/or Instrumentals featuring the kind of instrumentation typical to this genre such as: clarinet, saxophone, trumpet, trombone, double bass, drums, keyboards, electric guitars, guitars, strings, etc. Give him full sounding Songs and/or Instrumentals that feature a tight rhythm section that supports a loose, flowing, improvisational, wind or brass section. Your submission will be used as background source music (in a dancehall or from a radio) for a flashback scene in this film. You can submit ORIGINAL pieces **OR** material that's in the Public Domain. You do NOT have to submit an authentic vintage master recording for this pitch. Recently recorded Songs and/or Instrumentals that have been made to sound vintage could work very well. Please do NOT submit anything that sounds stiff or MIDI-driven. It's important that your submission has the authentic character and feel like the Standards you could find in The Great American Songbook. If you submit a song with a vocal performance, please be sure your lyric themes have Universal lyrics. Avoid references to specific dates, names, times, places, brands, etc. Lyric themes about twerking, cell phones, Vanilla Ice, etc., probably won't work well for this pitch ;-) Keep your lyric themes true to topics relevant to the popular culture of the '30s -'50s era. The estimated license fee for this is $1,000 - $5,000. This is a Direct-to-Music Supervisor placement, so you'll keep 100% of the sync fee and any applicable performance royalties. No Publisher Splits. You'll also keep 100% ownership of all your original rights! You must own or control 100% of the Master and Copyright to pitch for this opportunity, unless you submit a track that's Public Domain. In this case, you'll need to own or control 100% of the Master. Please do not copy or rip off the referenced artists or compositions in any way, shape, or form. Broadcast Quality is needed (great sounding home recordings are fine). All songs will be screened on a Yes/No basis. No full critiques. Please submit 1-3 songs no later than MONDAY, August 25th, by 2pm (PDT). TAXI #U140825BB www.taxi.com Good luck! 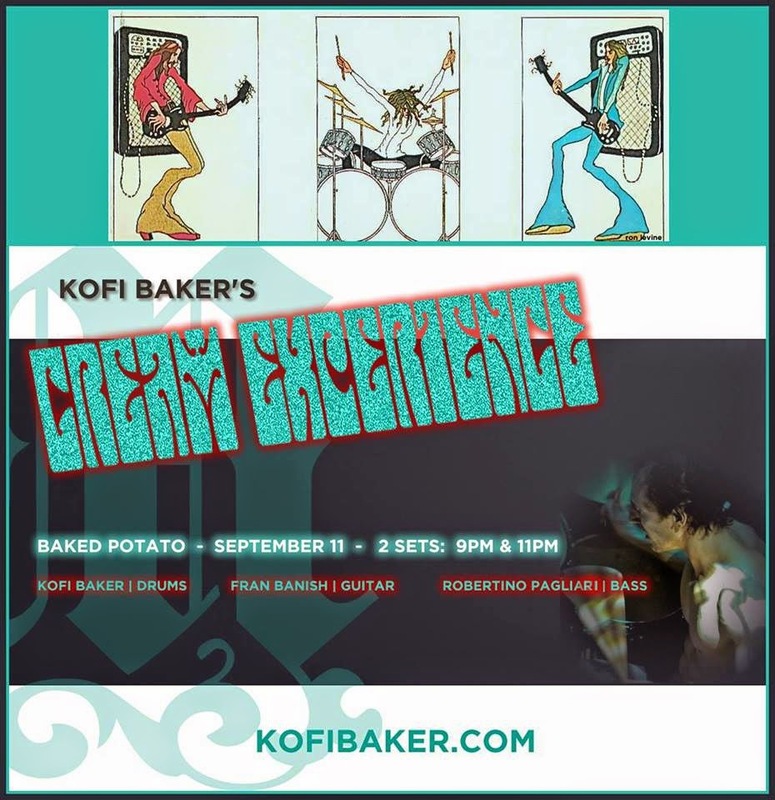 Kofi Baker's Cream Experience live in LA! KOFI BAKER'S CREAM EXPERIENCE LIVE IN LOS ANGELES! Celebrating Contessa's Birthday in LA! Celebrating Contessa's Birthday this Sunday, August 24th @ The Terrace. The event will be hosted by saxophonist/flutist Maestro Bobby Ramirez and band--also including: Jose Velasquez, bass; Antulio Mora, piano; and Ivan Velasquez, drums. Area musicians are welcomed to sit in. Blu-ray Audio of the Month - "Oscar Peterson"
Yvonne Black & Joseph Cristopher celebrating the release of "Back For More" in LA! 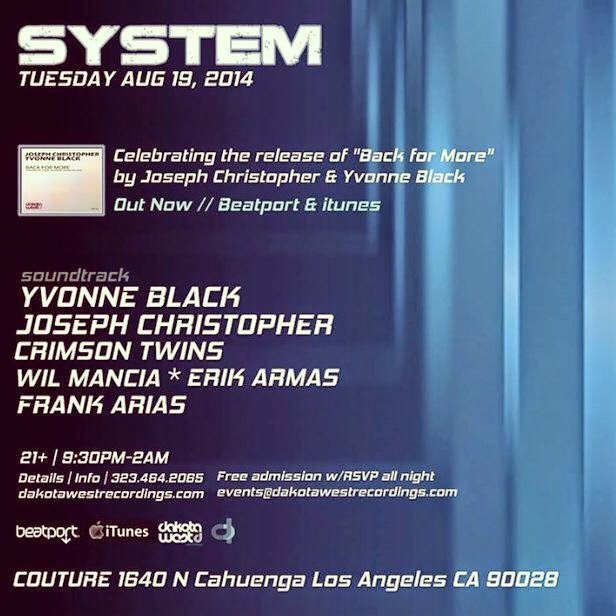 DJ Yvonne Black & Joseph Cristopher celebrate the release of "Back For More!" 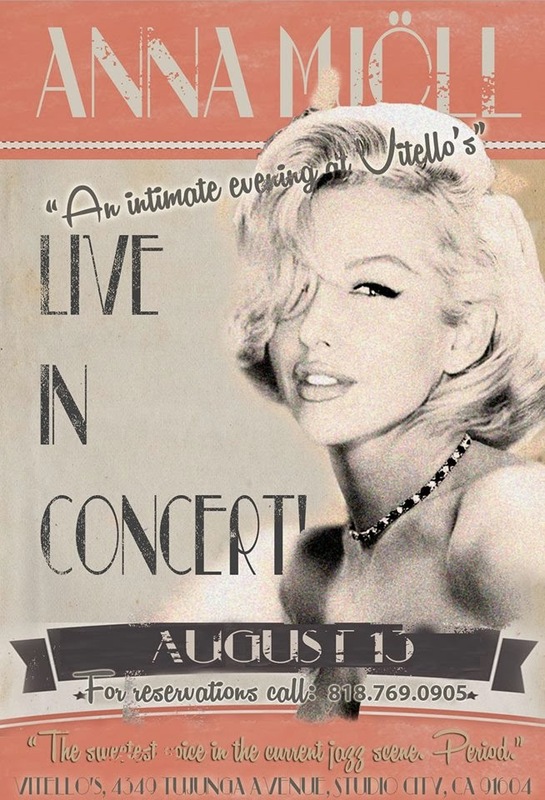 This next Tuesday, August 19 @ Couture (1640 N. Cahuenga, Los Angeles, CA). From 9:30pm till 2am. 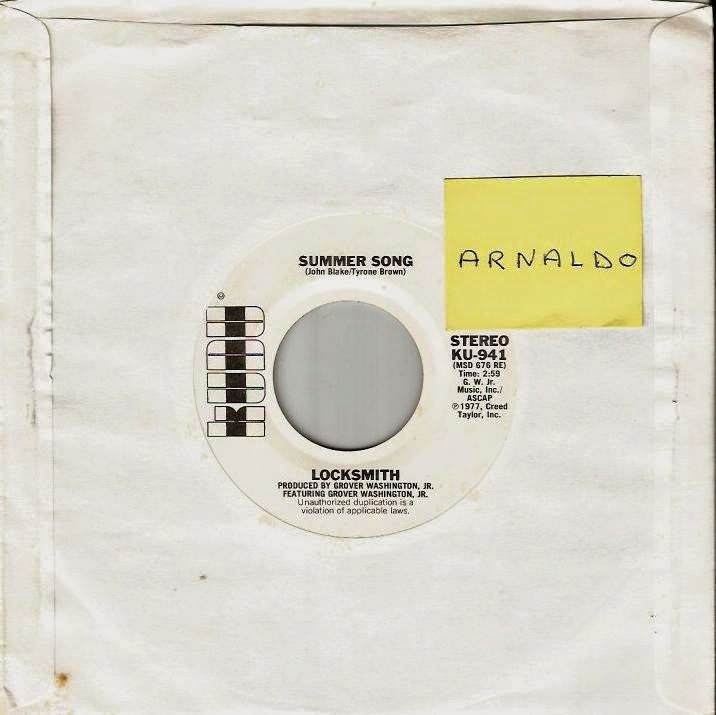 Single of the Day - "Locksmith: Summer Song"
Produced by Grover Washington, Jr.
(P) 1977, Creed Taylor, Inc. R.I.P. 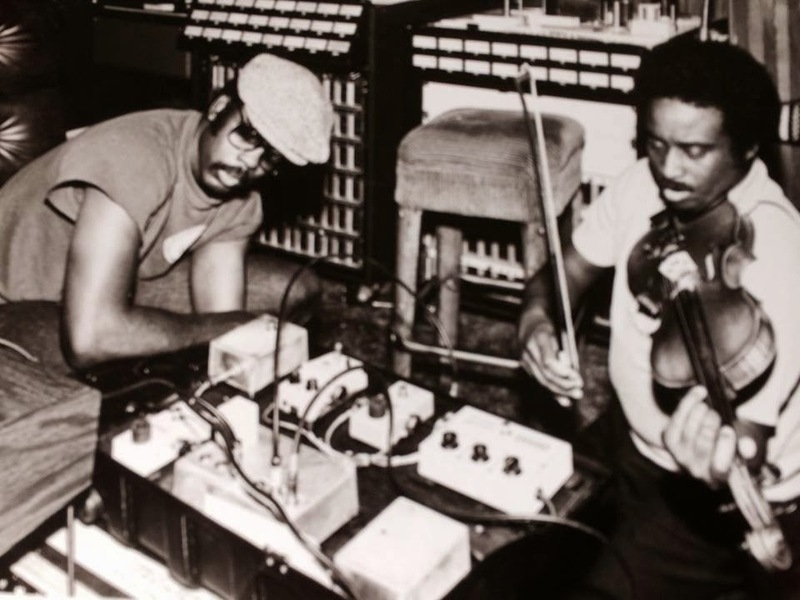 : As I had posted on Facebook a couple of days ago, violin virtuoso John Blake, born July 3, 1947 in Philadelphia, PA, and who recorded for CTI as a member of both Locksmith and Grover Washington, Jr.'s bands, passed away on August 15 (in his native city) of complications of multiple myeloma. He was 67. 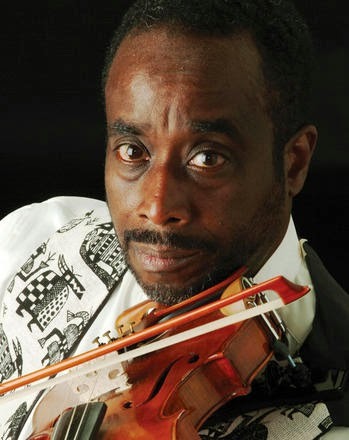 The Philadelphia born violinist John Blake, Jr. has been one of the world’s leading jazz violinists for over four decades. A four-time winner of the Down Beat Critics’ Poll Violinist Deserving Wider Recognition category he was also one of the top two jazz violinists in the 49th, 50th, and 51st Down Beat Readers’ Poll, Classically trained, Blake first gained recognition on early '70s recordings he made with Archie Shepp and in the mid-70s became established with a global audience during three years recording and touring as a member of Grover Washington, Jr.’s popular “crossover” jazz band. He then spent five years working extensively as a member of various ensembles led by pianist McCoy Tyner. Among other artists with whom Blake has performed and/or recorded with are the Duke Ellington Orchestra, Turtle Island String Quartet, Quartet Indigo, the Steve Turre Sextet, the Billy Taylor Trio, Avery Sharpe, Cecil McBee, Jay Hoggard and James Newton. Blake released his recording debut as a leader and composer, "Maiden Dance," in 1984, the first of five well-received projects on Gramavision Records including one that teamed him up with fellow jazz violinists Michal Urbaniak and Didier Lockwood. He released his sixth album, "Quest," that reunited him with Grover Washington and featured Joe Ford, Charles Fambrough, Ben Riley, Omar Hill, Joey Calderazzo, on Sunnyside Records in 1992. Blake’s first recording with his touring quartet, "The Traveler," was released in 2007. Born in Philadelphia on July 3, 1947, Blake began studying violin in that city’s public school system and at the Settlement Music School. After graduating from West Virginia University he did postgraduate work at the Institute for Advanced Studies in Montreux, Switzerland and received a grant to study studied East Indian music. In addition to his work as an instrumentalist performing with his quartet and as a featured guest soloist at concerts and on studio sessions, Blake was also an accomplished composer, arranger and producer as well as an author, teacher and lecturer who presented hundreds of workshops annually to musicians at all levels. He co-wrote with Suzuki educator Jody Harmon J.I.M.E., the definitive beginning string jazz method book and CD in use around the world. 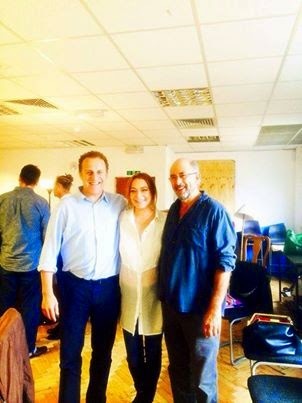 In addition to lecturing on campuses throughout the US, Blake was on the faculty of the University of the Arts in Philadelphia and at the Manhattan School of Music in New York City, and has been a guest lecturer at Berklee College of Music in Boston. In 2004 he was appointed to the Basler Chair of Excellence for the winter semester at East Tennessee State University and that year also was awarded a Chamber Music America Jazz Composer Grant. He is survived by his wife of 38 years, Barbara Irene Blake; a son, the drummer Johnathan Blake; two daughters, Beverly Woodson and Jennifer Watson; two brothers, Alan and Elliot; and six grandchildren. Rest in Peace. 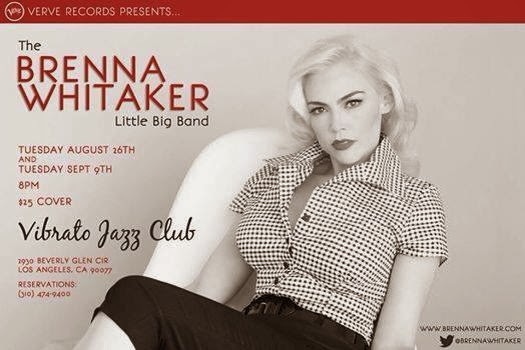 Verve Records Presents The Brenna Whitaker Little Big Band live @ Herb Alpert's Vibrato in Los Angeles. 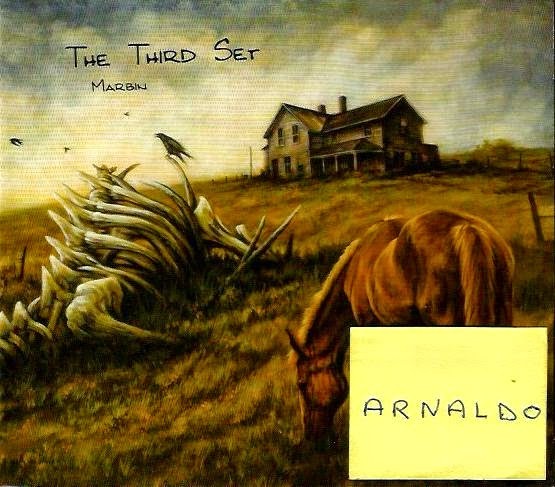 Fusion CD of the Month - "Marbin: The Third Set"
All the music on the album was recorded live on tour between March April 3rd and April 14th 2013. Recorded & mixed by Caleb Willitz and, mastered by Brian Schwab. What does a band that has performed over 1000 shows during the course of the last four years do for an encore? -- Recording a scorching, balls-to-the-wall, three-alarm live album seems like a natural progression! Without question, one of the hardest-working, most motivated and -driven independent bands in the world today, Marbin's The Third Set is a testimony to the work ethic, drive and determination which has become synonymous with their name, and the depth of musical diction, styles and textures these gentlemen have reached. Beyond that, it's a bone-crushing, no-holds-barred, sonic feeding frenzy -- as the young lions devour a sizzling set of their best material with unparalleled intensity!! Capturing facets of their style, sound and group interaction as only a smokin' live performance possibly could, The Third Set is the ultimate live document of a band in peak form and firing on all cylinders. Ever the musical chameleons, Marbin continues to expand their horizons while pushing their music to the absolute limit! Both founders, guitarist Dani Rabin and saxophonist Danny Markovitch, show more-than-ample evidence of the fire that burns in them. Rabin's chops have never been more hard-hitting, emotional and convincing; with blazing legatos lines alternately punctuating proceedings with Beck-like melodic phrasings and sweet chord comp work, Dani's many hours of off-stage preparation and sustained musical growth are clearly in evidence. Markovitch is equal to the task: playing with more fervor than ever before, with his perfectly-interspersed and -articulated lines weaving their magic. With Justyn Lawrence and Jae Gentile holding down the fort, laying down tight-knit syncopations and grooves throughout this scalding set, the band never sounded more on top of their game. (... who said "playing with fire" was a bad thing?) The Third Set is the next step forward in the evolution of Marbin, as today's prodigies transform into tomorrow's progressive luminaries. Fasten your seat belts for this one, kids: it hugs the tight corners while refusing to let off the gas! 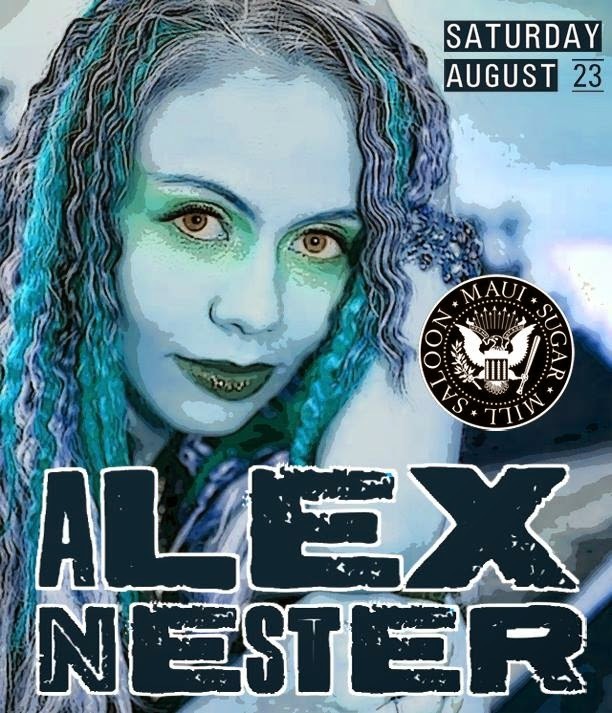 Next week, on August 23, at 9pm, don't miss the Alex Nester Band hitting up the Maui Sugar Mill Saloon (18389 Ventura Blvd, Tarzana, CA). Featuring Andre Hillman on keys, Max Rich on guitar, Tristan Gajate Garcia on bass, and Johnny Franco on drums. "For all our musician friends--bring your axe and come jam with us," says Alex. You go, girl! 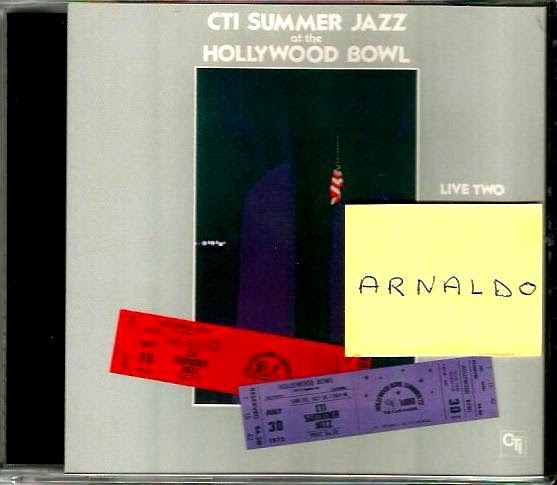 Instrumental CD Reissue of The Month - "CTI Summer Jazz At The Hollywood Bowl - Live Two"
Featuring: Bob James, Eumir Deodato, Johnny Hammond, Ron Carter, Jack DeJohnette, Airto Moreira, Milt Jackson, George Benson, Hubert Laws, Freddie Hubbard, Stanley Turrentine, Hank Crawford, Joe Farrell & Grover Washington, Jr. Recorded in 1972, originally released in 1977, now reissued in 2014 as a bonus CD of the "CTI Supreme Collection" series. 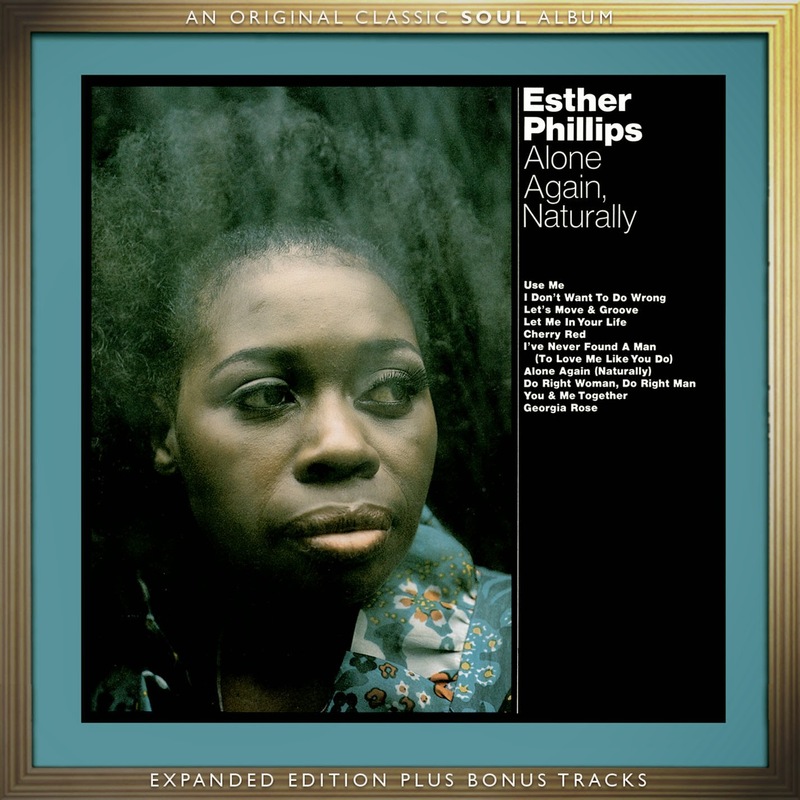 Vocal CD Reissue of the Month - "Esther Phillips: Alone Again, Naturally"
Following the 1972 release of her groundbreaking "From A Whisper To A Scream" album, Esther Phillips—who had enjoyed hits as a child star (Little Esther) in the '50s and as a R&B/jazz stylist in the '60s—was experiencing caareer rejuvenation with Creed Taylor's Kudu label after kicking a long-time drug addiction and a spell in rehab. Keeping with the same basic formula of surrounding the distinctive soulful vocalist with redoubtable arranger Don Sebesky, top class label mates Hank Crawford, George Benson, Eric Gale and Ron Carter and all-star players (James Brown alumni Maceo Parker and rhythm arranger Pee Wee Ellis, Billy Cobham, Richard Tee, Cornel Dupree, Ralph MacDonald and Gordon Edwards), producer Taylor provided the perfect setting for Esther's interpretative skills. The result was the best-selling "Alone Again, Naturally," a Top 20 jazz and Top 30 R&B album in 1973. The song choices were stellar: two songs from Bill Withers, "Use Me" (that features a tasty break in the intro, and was covered by Jamie Cullum on the "Live at Montreux 2009" CD by the CTI All-Star Jazz Band) and "Let Me In Your Life"; "I Don't Want To Do Wrong" (a 1972 hit for Gladys Knight & The Pips), "Let's Move & Groove Together" (a 1965 R&B charted single for Johnny Nash), Eddie Floyd's re-gendered "I've Never Found A Man," an Aretha Franklin cover, "Do Rght Woman, Do Right Man," and two powerful reinterpretations of Gilbert O'Sullivan's pop mega-hit "Alone Again Naturally" and "Georgia Rose" (previously recorded by Tony Bennett) with a special intro penned by poet/artist Gil Scott-Heron (whose "Home Is Where The Hatred Is" had given Esther a 1972 hit). A blistering blues, "Cherry Red," originally cut by Joe Turner, was the perfect showcase for Esther's emotive approach; this 2014 reissue from Real Gone Music in association with SoulMusic Records also includes a rare live 1972 recording of the song that Esther performed at a CTI All-Stars concert at the Hollywood Bowl in July 1972 as well as her superlative reading of Billie Holiday's "God Bless The Child" from the same show, with support by Hubert Laws, Freddie Hubbard, Hank Crawford, Airto Moreira, Bob James, Ron Carter and Jack DeJohnette among others. Liner notes are by renowned U.S. writer A. Scott Galloway from his original essay for the out-of-print reissue of the original album. "This month I am proud to announce a DELUXE reissue of ESTHER PHILLIPS' classic second Kudu/CTI Records LP - Alone Again, Naturally (1973) - for which I wrote the liner note essay. Though there was no way it could top its predecessor, From A Whisper To A Scream, it stands tall on its own today with the blistering blues of "Cherry Red" (with the late, great Cornell Dupree on guitar), the Black woman's anthem "Georgia Rose" (her opening spoken monologue composed expressly for her by Gil Scott-Heron), TWO Bill Withers covers from his just-then released Still Bill LP (a funky reggae take on' "Use Me" f/ Bernard Purdie on drums, and a gorgeous float through "Let Me In Your Life"), and the breezy single "I've Never Found a Man (To Love Me Like You)" (featuring some burnin' bass work by Gordon Edwards). This SoulMusic Records reissue also includes TWO bonus tracks from a Summer of `72 live set at the Hollywood Bowl: "God Bless The Child" and an encore of "Cherry Red." Step right up and get your soul tune up today by clicking the blue Amazon link below. Enjoy." 'Sweet' Sue Terry strikes again! She's been described as "formidable" (Ray Barretto), "remarkable" (National Public Radio), a "saxophone master" (Dr. Billy Taylor), "simply extraordinary" (Die Wahrheit, Berlin, Germany), and a "superwoman of jazz" (Hartford Courant). A former protégée of Jackie McLean, she recently made the bold move to give up alto saxophone—the horn that made her reputation—in order to focus exclusively on soprano and clarinet. She's also published two non-fiction books and holds eight USKSF Championship Tournament gold medals in taiji quan kung fu. Her latest project? A prolific creator, this year Sweet Sue collaborated with American film director Ashley Rogers and Venezuelan cinematographer Hernán Salcedo on a 9-minute documentary short titled The Source. It was written and narrated by Sue and was filmed while she was Artist in Residence at the Jazz Society of Ecuador. It features stunning visuals of the Ecuador landscape as well as live music scenes with up and coming Ecuadorian musicians and a guest appearance by New York pianist Bob Albanese. in "The Art of the Duo"
This is their annual FREE concert for the community! ‘Sweet’ Sue Terry is a Yamaha Artist. She uses Jody Jazz mouthpieces, Manning ligatures and Légère reeds. For more information please contact Qi Note, Inc.
Icelandic singing sensation Anna Mjöll will bring her jazz stylings to Upstairs at Vitello’s Jazz & Supper Club (4349 Tujunga Ave, Studio City, CA) on Wednesday, Aug. 13. The blonde beauty from Reykjavik has been wowing Southern California audiences with musical performances dedicated to the Great American Songbook, winning glowing reviews from critics and audiences alike. Mjöll has music in her DNA, growing up in Iceland as the daughter of two of the country’s best-known jazz musicians. Her father, Olafur Gaukur, is one of Iceland’s most-respected jazz musicians, recording many acclaimed albums in his lifetime. Mjöll’s mother, Swanhildur Jakobsdóttir, is a renowned singer and radio and television personality. She recently joined her daughter on stage for a rare appearance at a popular Icelandic jazz club. Mjöll has been called “Iceland’s gift to contemporary jazz vocalizing” and will demonstrate why that is true at her Vitello’s engagement. Showtime is 8pm. Decades before Tujunga Village became one of the Valley’s trendiest retail stretches, Vitello’s Restaurant took shape in Studio City a few doors north of Woodbridge Street. Vitello’s became a hangout for the Rat Pack & Frank Sinatra’s autographed photo still occupies a place of honor in the restaurant’s Hall of Fame today. TV & Movie talent still continue to drop by for a plate of Pasta after taping shows at Studio City’s CBS Radford Studios lot, NBC & Universal Studios & sound stages. It is a Hollywood tradition! Happy 73th Birthday, Airto Moreira!